Invasive corallimorphs have colonised a modern shipwreck at Palmyra Atoll in the Line Islands. The corallimorphs have benefitted from a phase shift in the reef’s ecosystem brought on by the shipwreck’s iron components leaching into the water column. Image: Susan White/US Fish and Wildlife Service. This past January, a collaborative research team comprising maritime archaeologists from the Silentworld Foundation and the museum conducted a shipwreck survey at Kenn Reefs in Australia’s Coral Sea Territory. The team relocated a number of historic shipwrecks documented by the Queensland Museum in the 1980s, as well as four new wreck sites. The Kenn Reefs complex is a seamount system located within the ‘Outer Route’, a seaway used by nineteenth-century mariners in an effort to avoid the Great Barrier Reef when travelling to and from Australia’s east coast. The discovery of multiple shipwreck sites of nineteenth-century vintage at Kenn Reefs demonstrates the hazards faced by mariners as they transited through waters that were insufficiently charted. Field investigations included reef-top inspections, metal detector and magnetometer surveys, and diver-based ground-truthing of observed features and buried anomalies. According to archival sources, at least eight vessels are known to have wrecked at Kenn Reefs during the nineteenth century. These losses, and others at isolated reefs dotted throughout the ‘Outer Route’, eventually prompted British authorities to order an official geographic survey of Kenn Reefs in 1859. The survey, led by Royal Navy officer Henry Mangles Denham, resulted in the reef complex’s location being accurately plotted for the first time. Denham’s chart contains several notable features; foremost among them are the positions of five unidentified shipwrecks. All of these wreck site locales approximately correlate to the locations of archaeological sites recorded during the 1987 and 2017 surveys. Data collected during both surveys has been integrated within a Geographic Information System (GIS) that allows the team to view the spatial arrangement of each shipwreck site, essentially providing a ‘bird’s eye view’ of the overall survey area. The presence of multiple historic shipwrecks within a relatively confined area—an attribute that exists at Kenn Reefs—often means cultural material from these sites is located in very close proximity, or even overlaps. This can lead to confusion, but a useful counter to the problem is GIS, which enables the user to build layers of data that allow for seamless integration of information. Datasets (and their respective metadata) that may be integrated within a GIS project include Global Positioning System (GPS) coordinates, satellite imagery, bathymetric survey data, aerial photographs, regular image files and contour maps. The collation of multiple data streams within a single digital management system provides a means to better analyse and interpret a given site or group of sites. Satellite image of the southernmost reef in the Kenn Reefs complex, showing the locations of historic shipwreck sites relative to dark linear areas of discolouration generated by ‘black reefs’. Image: Harris Geospatial/Silentworld Foundation. 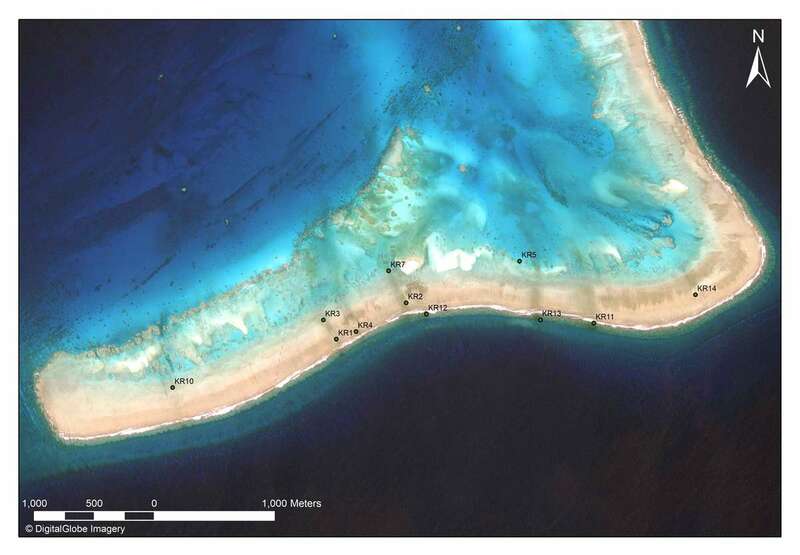 Upon superimposing GPS data over high-resolution satellite imagery, the team noticed obvious evidence of effect(s) wrought by historic shipwrecks on the reef crest (reef top) of the southernmost reef in the Kenn Reefs complex. It appears in the form of a large, dark linear area of discolouration oriented roughly north-to-south across the reef crest in direct association with the plotted position of every identified shipwreck site. Physical scouring of reef substrate is associated with the discolouration and clearly visible in satellite imagery. These scour zones likely resulted from the initial impact of the vessel’s hull on the reef and subsequent physical motion of it being pushed—in whole or in part—across the reef flat. The discolouration, by contrast, seems to originate from large artefacts or features (e.g., anchors) manufactured from iron. 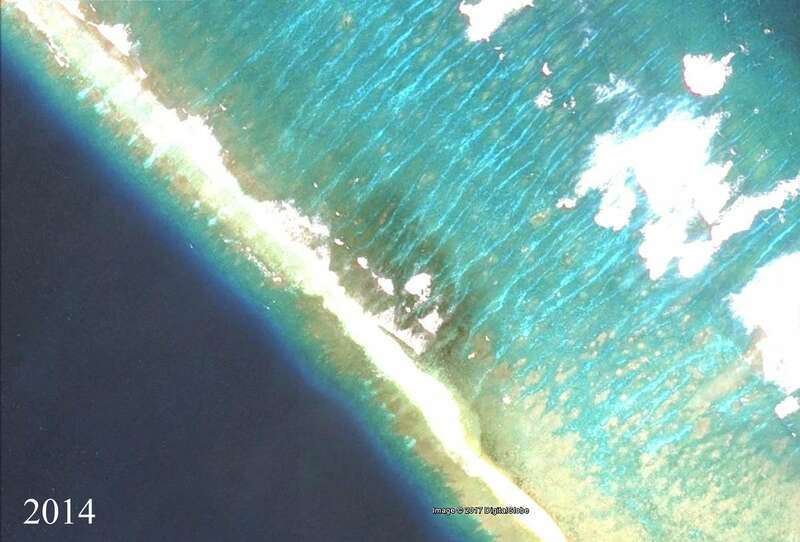 The discolouration widens as it extends north towards the lagoon on the inside of the reef. Three large anchors associated with the Dutch ship Hesther, which wrecked at Kenn Reefs in 1854. 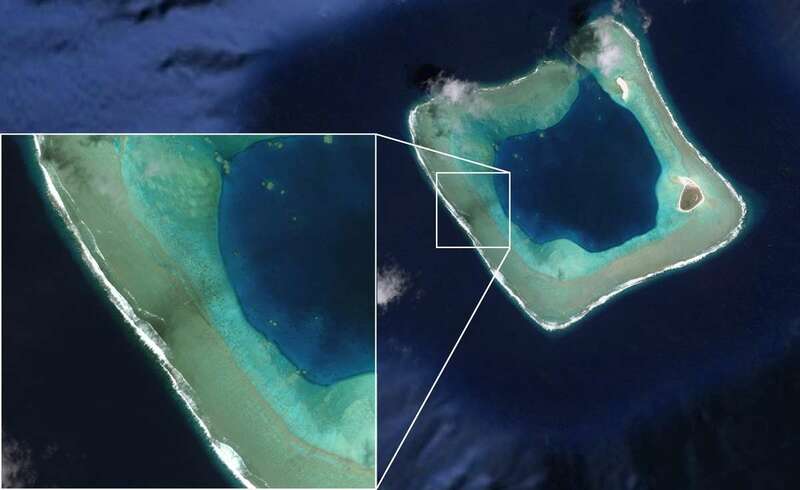 The anchors and other large iron objects associated with the shipwreck site are the sources of dark discolouration on the reef that is visible in satellite imagery. Image: Julia Sumerling/Silentworld Foundation. The phenomenon appears to have only occurred on the southernmost (and windward) section of Kenn Reefs, as it was not observed on any other part of the reef complex. It quickly became evident to the team that the combined discolouration and abrasion was indicative of historic shipwreck sites. Using these features as a guide, at least one other potential shipwreck has been identified via satellite imagery (although its identity was not visually confirmed during either the 1987 or 2017 survey). Further research has revealed the discolouration is the result of a phenomenon described by marine scientists as ‘black reefs’. It has been observed at various sites of modern shipwreck or contemporary natural disaster, but its association with the former is not well studied and research is ongoing. The results of a study published by marine biologist Terry Done noted that apparent ‘staining’ of coral reefs is caused by a ‘phase shift’ in which a coral dominated system (inclusive of microalgae) is replaced by a predominantly (macro)algal one. There are several factors that may facilitate a phase shift and leaching of a shipwreck’s iron and iron-based components into the surrounding water appears to be one of them. 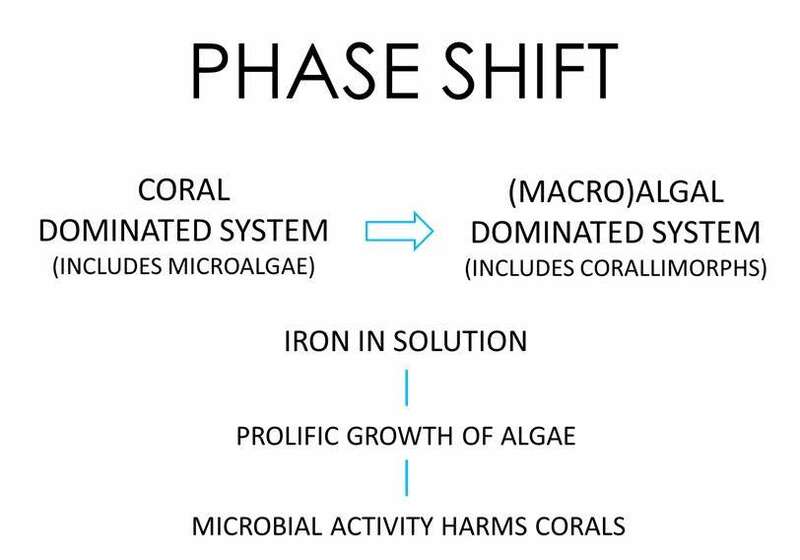 This diagram illustrates the phase shift that occurs when a coral dominated reef system is affected by increased iron in solution, and subsequently replaced by a predominantly (macro)algal reef system. Image: Irini Malliaros/Silentworld Foundation. Studies at modern shipwreck sites in 2008 and 2012 revealed that elevated levels of iron in solution promote prolific algal and corallimorph growth. Corallimorphs are an order of marine cnidarians closely related to stony or reef-building corals and typically feature a narrow column topped with a wide oral disc. The microbial activity associated with increased concentrations of algae and corallimorphs in turn eliminates corals and coralline algae. In the case of modern wrecking events, the type(s) of cargo and fuel(s) carried aboard a vessel may accelerate the phase shift process in the benthic community immediately surrounding the shipwreck site. This phenomenon was documented at Australia’s Myrmidon Reef in 1984 by marine ecologist Bruce Hatcher. Satellite image of Rose Atoll (American Samoa), showing ‘black reefs’ generated by the wreck of the modern fishing vessel Jin Shiang Fa. Image: Google Earth/DigitalGlobe/NOAA. 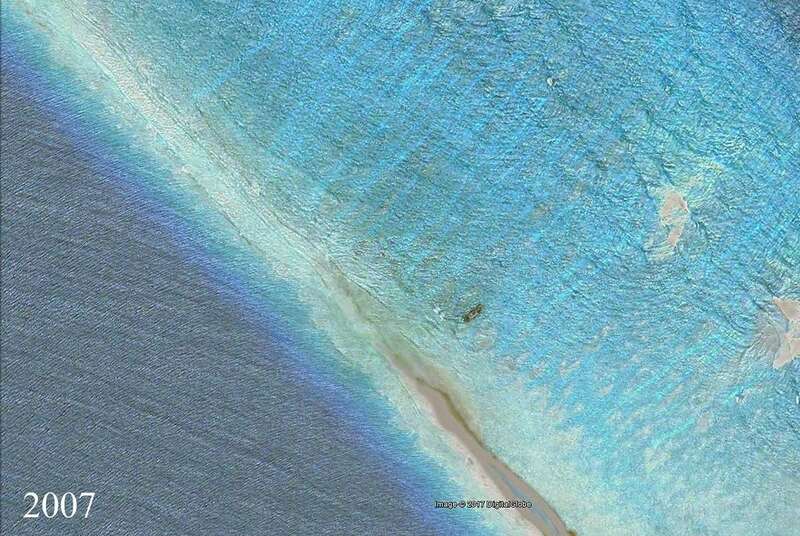 Satellite image of Kingman Reef in 2007, showing a wrecked fishing vessel approximately one year after its loss. Image: Google Earth/DigitalGlobe/NOAA. Satellite image of the same section of Kingman Reef in 2014, showing the proliferation of ‘black reefs’ around the wrecked vessel (which is no longer visible above the water’s surface). Image: Google Earth/DigitalGlobe/NOAA. 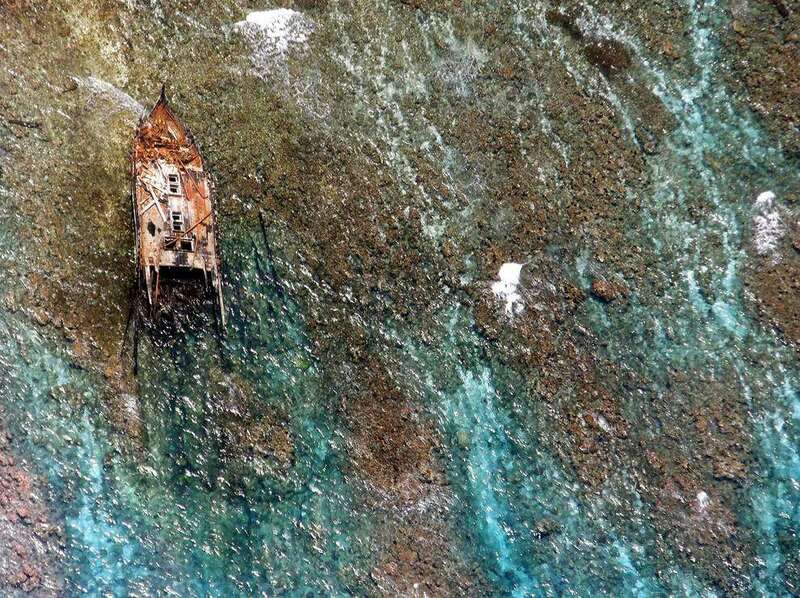 Close-up image of the wrecked vessel at Kingman Reef, showing areas of adjacent reef colonised by dark green algae. Image: Jim Maragos/US Fish and Wildlife Service. Source: NOAA. Done has also explored the capacity for coral communities on an affected reef to recover dependent upon environmental conditions. Anthropogenic and natural disturbances may limit or completely prevent a reef from recovering and also can affect its rate of recovery. The shipwreck sites at Kenn Reefs display healthy coral and coralline algae growth, even on large in situ iron artefacts. In fact, heavier more stable objects such as anchors provide a surface to which corals can attach, as well as a substrate for coralline algal growth. Some algal growth was noted on these shipwreck sites during the 2017 survey, but is not overtaking the existing coral community. Turf algae dominates the shipwreck sites located on the reef crest but new coral growth is clearly evident. Large sections of detached limestone rubble on the reef crest indicate there may be other factors limiting the rate of coral community establishment, including structural damage wrought by cyclones and other severe weather events. Hard corals are thriving on a number of large iron artefacts at Kenn Reefs, including this Porter-patent anchor. This suggests a possible reversal of the ‘black reefs’ phenomenon at some historic shipwreck sites. Image: Julia Sumerling/Silentworld Foundation. 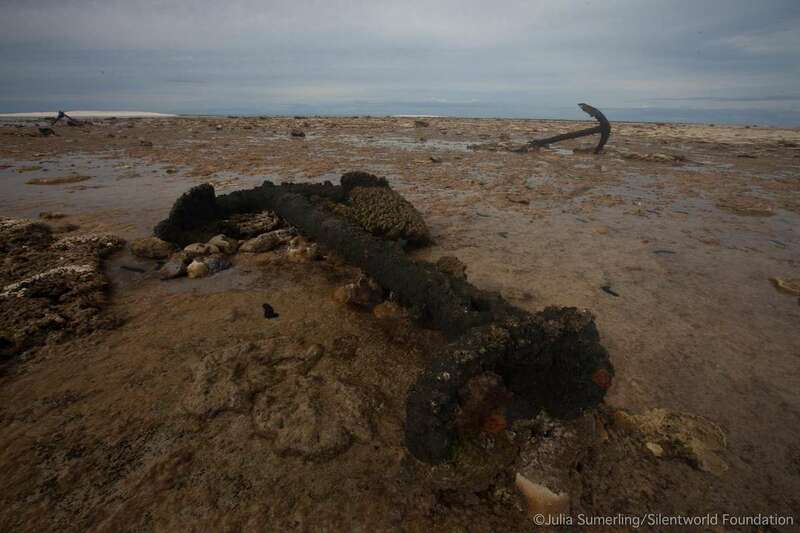 Reef recovery despite the presence of large iron artefacts has been noted at other historic shipwreck sites. In 1976, Neil North noted the absence of large corals during the excavation of the Dutch vessel Batavia (wrecked 1629), but also observed that coralline algae was found adhering to iron concretions. North attributed this trend to the site’s presence on the southern extremity of an actively growing coral reef, as well as the presence of favourable water conditions conducive to algal growth. He also noted that certain objects, such as bricks and iron markers placed on the site during fieldwork, were partly or completely covered by coralline algae in a matter of months. 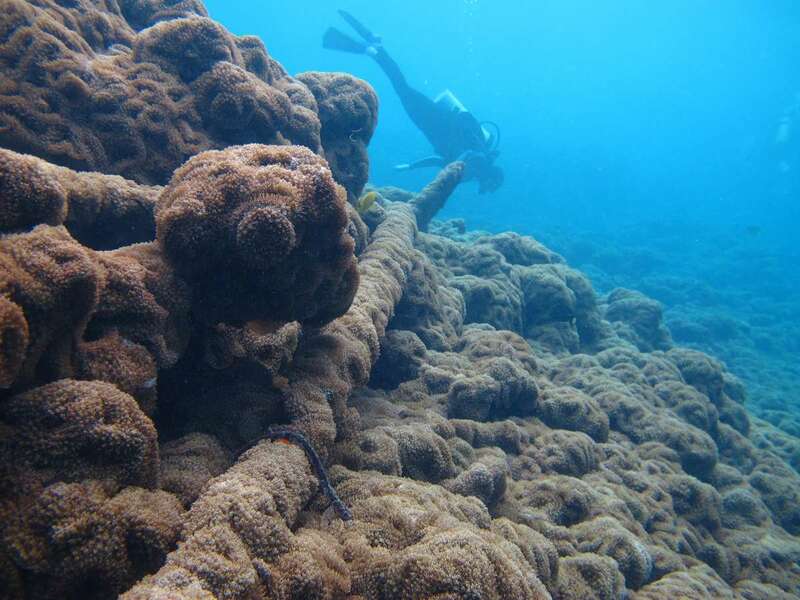 An iron mooring anchor used during the project was covered by a one centimeter-thick layer of coralline algae within three years. The presence of ‘black reefs’ in association with historic shipwrecks is a line of inquiry that has never been investigated. Understanding a coral reef’s ability to recover from a phase shift event that occurred over a century ago has modern implications. For example, data derived from analysis of reefs affected by historic shipwrecks could be used to assess and/or predict reef rebound from recent or future shipwreck events. Comprehensive study of the phenomenon in association with older shipwreck sites may reveal information about reef damage following the initial wrecking event. Perhaps most importantly, it may also provide empirical data regarding the prolonged effects of iron-based material that has settled on the reef, as well as the potential for reverse phase shifts and eventual recovery of affected benthic communities. Results stemming from this research could also prove beneficial in determining whether phase shifts are caused by other factors. This is of particular significance, given the stresses and threats coral reefs are currently facing worldwide. The Silentworld/ANMM team also postulates that ‘black reefs’ may occur in association with historic shipwrecks at other locales, and wish to pursue this line of inquiry to see if it is a consistently repeatable phenomenon that can be used as a predictive model for locating shipwreck sites. — Dr. James Hunter, Curator RAN Maritime Archaeology, and Irini Malliaros, Maritime Archaeologist, Silentworld Foundation. With thanks to our maritime archaeology program partners, Silentworld Foundation. You can also find a summary of this phenomenon on their blog. Explore more of the museum’s maritime archaeology initiatives on our website and on the blog. Done, T. J. (1992), Phase Shifts in Coral Reef Communities and Their Ecological Significance, Hydrobiologia 247(1): 121-132. Hatcher, B. G. (1984), A Maritime Accident Provides Evidence for Alternate Stable States in Benthic Communities on Coral Reefs, Coral Reefs 3(4): 199-204. Hatcher, B., Johannes, R. and Robinson, A. (1989), Review of the Research Relevant to the Conservation of Shallow Tropical Marine Ecosystems, Oceanography and Marine Biology 27: 337-414. Kelly, L. W., Barott, K. L., Dinsdale, E., Friedlander, A. M., Nosrat, B., Obura, D., Sala, E., Sandin, S. A., Smith, J. E., Vermeij, M. J. A., Williams, G. J., Willner, D. and Rohwer, F. (2012), Black Reefs: Iron-induced Phase Shifts on Coral Reefs, The ISME journal 6(3): 638-649. North, N. (1976), Formation of Coral Concretions on Marine Iron, International Journal of Nautical Archaeology and Underwater Exploration 5(3): 253-258. 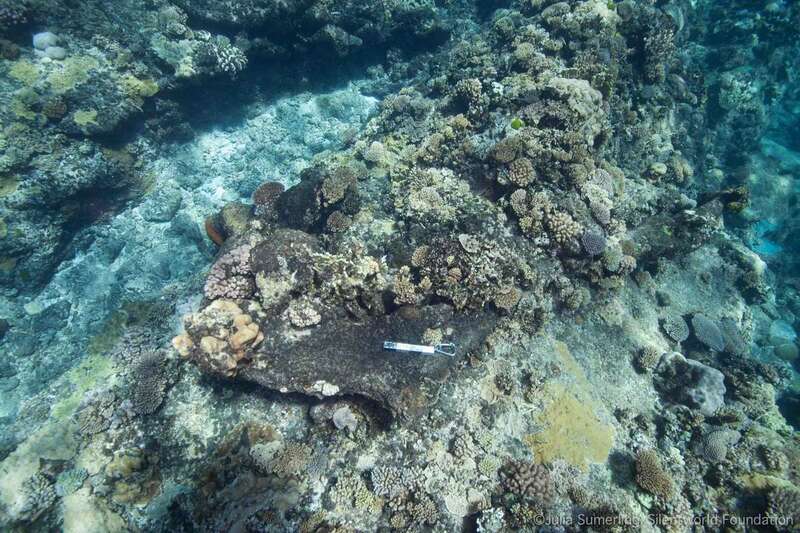 Schroeder, R. E., Green, A. L., DeMartini, E. E. and Kenyon, J. C. (2008), Long-Term Effects of a Ship-Grounding on Coral Reef Fish Assemblages at Rose Atoll, American Samoa, Bulletin of Marine Science 82(3): 345-364.